Studying for the bar exam. No one enjoys it and no one wants to repeat the experience. My question for this post is relevant to anyone taking a bar-exam prep class live or through video or audio: How do bar-exam students listen most effectively in studying for the bar? This post explores how bar takers can listen with power—bar-exam-taking power. The sad truth is that you can learn something a lot better when you already know it—or at least when you already know something about what you’re supposed to be learning. The less you know about a subject, the harder it is to listen and pay attention to anyone talking about that subject. The good bar-prep companies certainly know this and try to make the material entertaining and easy to follow. Look at a bar study guide for a quick outline of the topic. Look at the table of contents of a case book on the topic. If the topic is statutory, skim the statutory outline for that area of law your state. Make diagrams of the topic or find a diagram you can use to help think about what you’re going to hear. Recopying the diagram in your own hand will be more powerful than just looking at diagrams. Google the topic and find some real-world scenarios. Learning how this area of law works in the world could motive more focused listening. Look at a few bar-exam questions that ask questions on the topic. Not only could this build some knowledge by showing you how the issues might arise in a quasi-real-world situation, but it could also tap into a pretty powerful motivator of attention: FEAR. Listening is not the same thing as hearing, but hearing is necessary to listening. Therefore the most obvious thing to say here is to make sure you are hearing and paying attention to the lecture. 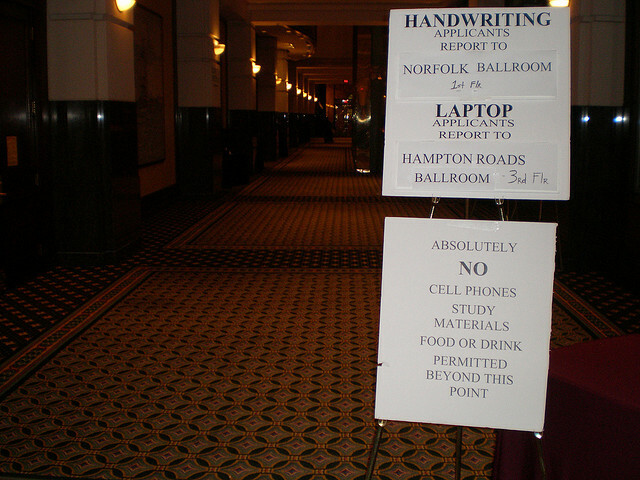 Don’t half-listen during the bar-exam lectures, assuming you’ll go over it in your notes later. Giving only “continuous partial attention” to the scintillating lecture on commercial paper means you’re already introducing an inefficiency into your bar preparation. People may prefer to learn a certain way, but that does not mean they actually do learn better that way; critics say the idea of “learning styles” is intuitively appealing but lacking in reliable proof. That controversy can’t be resolved here, and it doesn’t need to be. Just don’t use the idea of learning styles as an excuse to listen with less than full attention. Test-takers should take full advantage of different ways to learn from traditional lectures to charting to flash cards to a surprising option you can read about at the end of this post. And one more note about the initial hearing part: I really don’t think it will work to listen to bar-prep audio recordings on a speeded-up pace. (Do experts recommend this idea?) It seems you want some pauses in between the information to give your mind time to actually process it. Those pauses may frustrate the bored or distracted mind (more on this in a future post). But your goal in studying for the bar is not to be entertained every second. It’s to pass the d*mn bar. The prevalent models of the listening process all include a variety of hidden intellectual functions such as interpreting, translating, understanding, and evaluating. One trick to true understanding is knowing whether you in fact understand. But the Dunning-Kruger effect seems alive and well across every domain—meaning unprepared bar takers may be not only unprepared but also unable to know just how unprepared they are. Stated more constructively, try to monitor your own understanding while listening, and afterwards via practice exams. Lots of them. In a perfect world, we all understand everything the first time it passes our ears. But it’s not a perfect world, and the next best thing is to know something is important and also to know you’re not getting it. You might know it right then during the lecture, or later after bombing a practice exam. But then you can do something about the lack of understanding. Remembering (at least for the short term) is part of listening, and part of overall cognitive functioning. And remembering details—especially details that aren’t inherently interesting—is difficult. To prepare for a high-pressure memorization test, you want to get the information “set” in your long-term memory for use on the bar. This doesn’t mean remembering it forever, but long-term memory is the right term. Short-term or working memory only holds information for about 30 seconds tops, and that’s not good enough. To pass information to long-term memory, you have to bring it up and use it and repeatedly pass it back through your working memory. That means you can expect to do a lot of flash cards, practice exams, and other active study techniques to help this process. Active studying supplements the listening process and reinforces the learning. But is there anything bar students can do at the moment of listening to make the most of that listening moment, maximizing their memory for later? Here the power of the eye may help supplement the power of the ear. As you listen to the lecture, try diagramming what you learn. Make a visual. Make a chart. Draw a picture of each element of the test. Imagine a ridiculous scenario with a clown using commercial paper in some memorable fashion. If you’re really into exotic yet powerful memory techniques, try building a “Memory Palace” and associating different pieces of information with locations in your memory palace. The Bar Association of San Francisco wrote about this concept here. Solo Practice University wrote about it here. I haven’t tried it, but I did enjoy the book Moonwalking with Einstein, which is about the same technique and if nothing else, would be an entertaining post-bar-exam read. Do not take notes on your laptop. It is growing clearer and clearer (like here and here and here) that students remember material better when they take notes by hand, as in using handwriting on a piece of paper. This is hard pill for many law students to swallow because it cuts against years of habit. Maybe a more realistic recommendation is this: Don’t take notes on your laptop by default, just because you may have done so throughout law school. There is pretty good evidence that taking notes by hand is at least as good if not better than taking notes on a laptop. Try it. Maybe you’ll like it. Bar lectures are not a deep Socratic exploration of legal theory and jurisprudence. You don’t need to respond to a bar-exam lecture by lining up to pose some theoretical responses and analytical challenges to the material. (Really, please don’t.) As many bar-exam prep experts advise: nobody gets a special reward for an “A” on the bar exam. Likewise, bar lectures do not require an emotional, empathetic, caring reaction. Really, it may be the most antisocial learning environments of all time. What, then, is the proper response for a listener? The response is the studying. The flash cards. The practice essays. Clarification and deeper study of certain problem areas. Eventually, the response is what you do with the information on the exam. One bar prep source suggests that the #1 mistake is “passive studying.” Don’t go back and half-listen again. Study actively and aggressively to learn and retain the information. Use all the ways to learn, from lectures to diagrams to reading text to taking practice tests. Move around to different study locations to help you remember the material more, rather than staying in one comfortable place. And if you really need a change of pace, put in the earbuds and dance. Or at least think about dancing while taking in these “Bar Exam Study Songs.” (HT Lee Burgess of Bar Exam Toolbox for the review.) It’s an unexpected and unorthodox way to incorporate more listening into your bar-exam study routine—but why not? Bar-exam prep is a well-developed industry of its own, with many highly experienced and skillful tutors and prep resources. I’d love to hear from bar-exam prep experts with their advice on listening during the prep process. And for bar-exam takers, what types of listening techniques have worked or not worked? What would you recommend to those studying right now? Law-school prep for listening skills? ‘Tis the season of advice for 0Ls, meaning those about to enter law school this fall. While reading Scott Turow’s One L and banking some “me” time are both great, 0Ls might want to think about their listening. I once heard a law professor say that starting law school is like learning Chinese by being dropped from an airplane into a community where only Chinese is spoken. Law-school prep classes, boot camps, and online programs have sprung up to help students make the transition. Perhaps a law-school prep course is a little bit like reading a grammar guide and a few key survival-oriented sentences before the big drop. But there are ways to prep for law school without paying a fee, such as “by visiting your local Barnes and Noble.” Plain English for Lawyers by Richard Wydick and Getting to Maybe by Richard Fischl and Jeremy Paul are often recommended. These books are great, and as a legal-writing professor when I’m not blogging, I especially recommend Plain English for Lawyers. I would also add Barry Friedman and John Goldberg’s Open Book as a new and popular contender in the law-exam-prep market. But the skills these books ultimately focus on—writing legal documents and exam questions—are partially the artifacts of earlier skills in reading and listening. What about targeted prep for these skills? For reading, future law students may want to take a look at Ruth Ann McKinney’s Reading Like a Lawyer: Time-Saving Strategies for Reading Law Like an Expert. I also like Wilson Huhn’s The Five Types of Legal Argument. It’s not about reading per se but about the major building blocks of legal opinions and legal reasoning generally. Acclimate to the pace of a law school class. Incoming law students could search for a few lectures on YouTube and sample what they really sound like and how they move. Socratic interchanges and professorial pauses may be new experiences. Class can move slowly or very, very fast. Some students may want to work on smartphone etiquette and attentiveness so as to avoid distractions during class even when it seems to move slowly. This in turn is good practice for avoiding smartphone distractions during meetings and interviews with clients and others as a practicing lawyer. Even if a student loses no actual information by looking at a smartphone during class, that student may be sacrificing the speaker’s good impression. Start to develop a note-taking method. It is difficult to decide how to take notes in class before actually attending many—or any—real classes. But having a note-taking strategy in place before the first class should allow students to get more out of the first few classes and to adjust more quickly with experience. Lisa Needham published a post in the Lawyerist about the famous Cornell note-taking method, which she described as a way of “hacking chaos.” On a more specific note, I guest-blogged about one strategy, #professorsays, at The Girl’s Guide to Law School. Integrate reading and listening on a particular case. This is somewhat idealistic, but the idea is as follows: the reading raises questions and makes the student curious to find out whether and how the professor answers those questions. Then the student listens effectively in class because of having context (from the reading’s facts) and being curious (from the student’s questions). And then the student’s engagement with the material in class means the student will have even better questions to formulate when doing the next set of readings in preparation for the next class. Prepare yourself to ask questions—good questions—when you are confused. While listening and reading can be a virtuous cycle, most law students also have the experience of feeling really lost and confused at one point or another. Throughout the semester, and not just in the final push of studying for exams, students should monitor their own listening and thinking to recognize confusion setting in. Starting a conversation with the professor by asking good questions is one way to address a creeping sense of confusion. If asking a question after class is too crowded or just uncomfortable, go to the professor’s office hours or make an appointment. A law school prep class may give the opportunity to ask this kind of question. Outside of a prep class like this, listening to a law-school lecture on YouTube and then formulating some hypothetical questions. Or the same idea could be accomplished with a different communication medium. A student could read some difficult material and then imagine questions for a professor about what the student understands and where that understanding trails off into confusion and questions. What else? Listening to people. Effective classroom listening is valuable and necessary for law-school success, but not actually sufficient for good lawyering. What about the kind of listening lawyers really do? Lawyers talk to people (some friendly, some not friendly) in real conversations, in order to learn the facts, glean motivations, find out what else needs to be known, and discern how to make recommendations and arguments. This list is not meant to be exhaustive. The point is the intellectual listening integrating large blocks of topical detail in the 1L year is very different from the kind of listening lawyers actually do. A student might find it difficult to follow three classes on what constitutes various types of offers, but that same student might find herself highly motivated to interview a client about an alleged agreement starting with a so-called offer. So here’s a proposal for some unorthodox advice on law school preparation, with a particular focus on listening. In the summer before law school, volunteer to take an oral history for an archive project. Interview an older relative about some aspect of his or her life. Tutor a kid one-on-one. Invite a potential mentor to lunch and get that person talking about life and law school and law practice. It’s not exactly sipping piña coladas and having “me” time by the beach. Some of those suggestions may actually involve writing! But spending time in conversations like this will build listening skills. And it may even build up resilience and motivation—qualities that will definitely be needed later, to get over the hump of the 1L year.